The Freeburg-Waterloo starters stand at center ice for the National Anthem prior to a recent contest. A hockey season that began with title hopes came to an early end Monday night for the Freeburg-Waterloo Raging Bulldogs. Meanwhile, the Columbia Ice Eagles were in a must-win match Tuesday night against top seeded Collinsville. Freeburg-Waterloo dropped both games of its first round playoff series against Belleville. 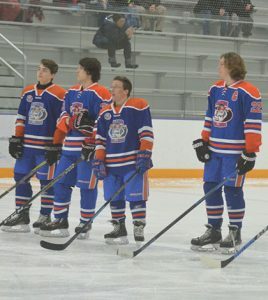 The Raging Bulldogs lost 7-2 on Thursday night and 7-0 on Monday night. Braden Fiscus and Paul Malacarne scored the goals for Freeburg-Waterloo in Thursday’s loss. The Raging Bulldogs finished the regular season at 16-4, good for the second best record in the Mississippi Valley Club Hockey Association. The team’s captain, Joe Lugge, led the Raging Bulldogs in scoring with 11 goals and 22 assists. He missed Monday’s game, and the team had a few players battling the flu.